An Dune in GTA San Andreas. The Dune is an off-road truck in Grand Theft Auto: San Andreas. The Dune is designed as an off-road racing adaptation of a large cab-over truck, outfitted with improved suspensions, off-road tires, five running lights, rollbars, and a two-tone racing livery. Its design is similar to endurance trucks competing in long-distance desert rallies, such as the Dakar Rally. Like most trucks in the game, the Dune is only capable of carrying two occupants. The Dune can hit various vehicles very hard because of the shocks. The Dune cannot be modified at any modification garage. The four wheel drive Dune features a powerful engine, and as a result, is remarkably good when negotiating off-road terrains, being more than capable of climbing up inclines where most vehicles would have more trouble traversing. However, its high center of gravity makes the vehicle unstable when tilting sideways, so caution must be exercised when driving the vehicle along bumpy terrain. The truck's soft suspension does help in minimizing rollovers to an extent, as well as easing cornering. While the Dune is ideal for off-roading, it has reasonable performance on tarmac surfaces as well. The speed and acceleration of the Dune is somewhat moderate. Braking is very good because of the soft suspension and high shocks. The Dune is sometimes called "Duneride" in the game files. 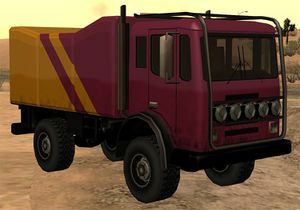 The Dune features a graphic glitch wherein the position of the ground's shine from its headlights is incorrectly located beneath the truck (overlapping its shadow); the glitch is eliminated if one side of the headlights is broken. The Dune plays the radio station K-JAH West by default when entered. The vehicle is ideal when driving dangerously to impress Katie Zhan in date, as its heavy weight allows it to ram traffic without losing momentum while soaking up a great deal of damage before being destroyed. If hydraulics are added to Dune via modding, the wheels will glitch out and move to the doors. Spawns at the entrance of the Blackfield Stadium in Las Venturas after the completion of Kickstart. This page was last modified on 15 August 2013, at 09:15.